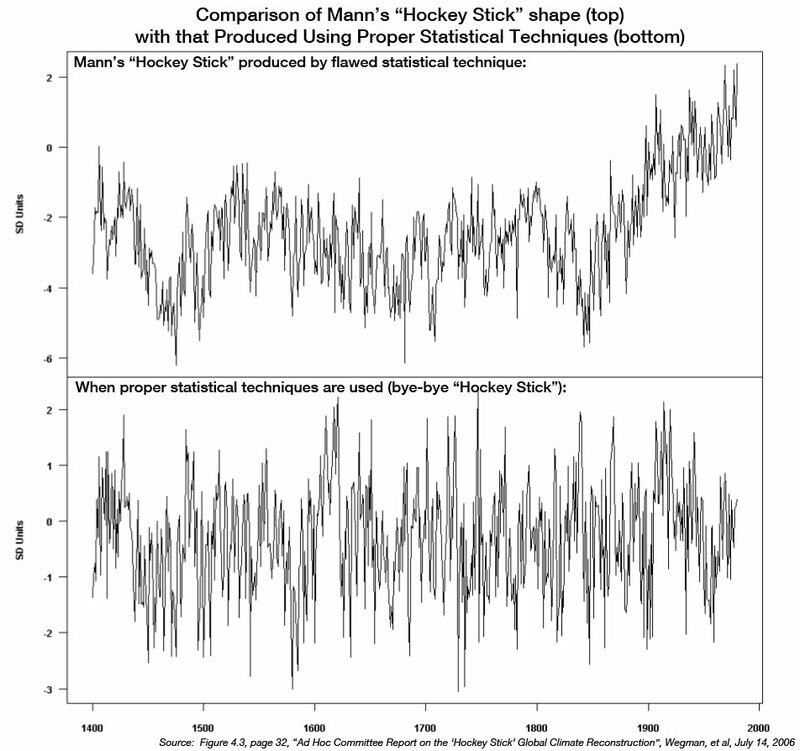 Make your own Michael Mann hockey stick at home | Watts Up With That? Following yesterday’s first look at emails from the 2 year effort to get NOAA to release emails from FOIA requests, where we learn that some scientists felt ‘Hit on the head with a hockey stick’ and that “The paleodata always got a lot more attention from the general public than it deserved.”. There’s a great article today at SPPI today Michael Mann — the ghost of climate past which summarizes the whole hockey stick affair quite well. It draws heavily on a post from May of this year on PJ Media by Rand Simberg titled The Death of the Hockey Stick? In that post I found this little nugget below from December 2009, one that I apparently missed in the furor immediately following Climategate1. I’m now correcting that oversight. What is it? 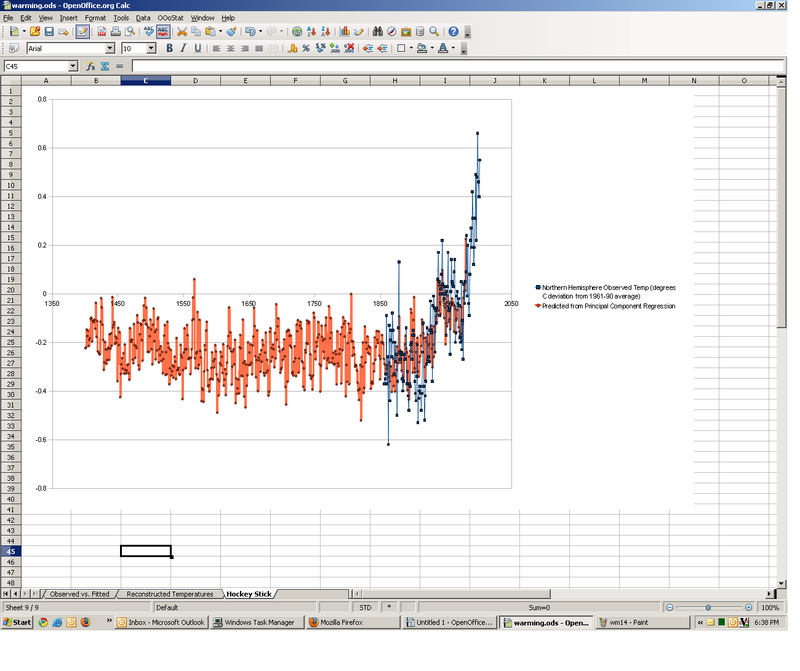 It’s the hockey stick recreated in Excel, using proxy data and instrumental data freely available on the web, something you can easily do at home. I figure the more people that explore this themselves using the easy to follow steps, the more people will understand what a statistical abuse the hockey stick is. The source of this tutorial is as surprising to me as it may be to you, and there’s no special software or secret Mannian Excel plugins needed to do the work yourself. I’ll let Rand Simberg explain. Ultimately, in addition to Mann’s claim for the dramatic recent uptick (which we are supposed to presume was a result of the late industrial revolution and equally dramatic increase in carbon dioxide into the atmosphere as a result of the liberation of carbon from burning long-buried fossil fuels), Keith Briffa of the Climate Research Unit (CRU) at the University of East Anglia in England controversially declared, based on Eurasian data, that the well-documented Medieval Warm Period (MWP), from around 950 to 1250 CE — the European Middle Ages — didn’t actually exist. This claim was important, if not essential, to Mann’s thesis, because his initial formulation only went back to 1400, the beginning of the so-called Little Ice Age. Critics of the theory thus argued immediately upon its presentation that it shouldn’t be surprising that the earth was warming now, given that we are still coming out of it, and that the medieval warming in the absence of late Carolingian SUVs and coal plants argued that the climate naturally cycled, with no need to invoke Demon Carbon. That is to say, to the degree that the hockey stick has a blade in the twentieth century, it would have another a millennium ago. The theory has continued to take blows over the years since it was first presented. 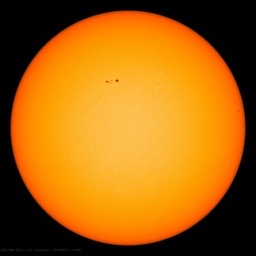 About a decade ago, a paper was published by Willie Soon and Sallie Baliunis claiming that there was good evidence that both the (still extant) MWP and current warming were driven by solar activity rather than carbon emissions. But these initial attacks were beaten back by the climate mafia (as we now know from the leaked emails between Mann and his partners in crime in East Anglia from two and a half years ago). The real damage came when a retired Canadian mining engineer, Steve McIntyre, and a professor at the University of Guelph, Ross McKitrick, started digging into Mann’s methodology, and found flaws in both his statistical analysis and data interpretation, and published a paper describing them in Geophysical Research Letters in 2005. They showed that Mann’s methodology would generate a hockey stick almost independently of the data input, by feeding it spectral noise. Later, Internet satirist (and apparent statistician by day) Iowahawk provided a primer on how to create a hockey stick at home, using a standard spreadsheet program. The devil, as they say is in the details. In each of the steps there is some leeway for, shall we say, intervention. The early criticisms of Mann et al.’s analyses were confined to relatively minor points about the presence of autocorrelated errors, linear specification, etc. But a funny thing happened on the way to Copenhagen: a couple of Canadian researchers, McIntyre and McKitrick, found that when they ran simulations of “red noise” random principal components data into Mann’s reconstruction model, 99% of the time it produced the same hockey stick pattern. They attributed this to Mann’s method / time frame for selecting of principal components. Run step 5 through step 7, but only include the first 2 principal components in the regression. I urge readers to replicate it yourselves. Knowledge is power, especially first hand knowledge. Here’s all you need to do it. I’ll be happy to publish what you learn. Anthony, the link to “Michael Mann — the ghost of climate past doesn’t work” – it should be http://sppiblog.org/news/michael-mann-the-ghost-of-climate-past. Anthony, I’ve always wondered, why isn’t there a link for the SPPI site on your list of skeptic blogs? I often use WUWT as a base or springboard to visit other skeptic sites, but SPPI is not there. August 22, 2012 1:15 P.M.
And this is where you come in. If Mann goes through with it, we’re probably going to call on you to help fund our legal fight and our investigation of Mann through discovery. If it gets that far, we may eventually even want to hire a dedicated reporter to comb through the materials and regularly post stories on Mann. But, but, where’s the corrected graph, you know, the one that uses all the correct methodology to not produce a hockey stick? Oh, it’s still a hockey stick? “Mann’s work has been proven time and time again to not be fraudulent because it has been reproduced by others.”. Why, Yes! It has been reproduced…BUT the question is – Why would you want to reproduce it? Some advertisement is causing your webpage’s main page not to load correctly at least in firefox. Only the first topic is presented, then you can read “ADVERTISEMENT” and then nothing else loads. Happened already 3 times to me. It’ impolite not to link. But… but… Here is the corrected Mann chart. See? There is nothing unusual about current temps. And here is a comparison of results using data that Mann threw out. Where’d Mann’s Hokey Stick go? And here is the data that Mann hid in an ftp file labeled “censored“. Here is Mann’s email from Tim Osborne. And here is Prof Wegman’s comparison in Wegman’s testimony before Congress. Here, Mann erases the MWP in order to make his hockey stick scarier. And of course, the late, great John Daly totally deconstructs Mann’s chart here. Now tell the truth, Andrew. Would you still buy snake oil from that Mann? It appears that Mann’s definition of “robust” is not robust. Thanks smokey, your first link gives no source, your second link gives no source, your third link is broken, your forth link gives no source, your fifth link means nothing, your sixth link doesn’t actually show climate date at all, it’s just a random noise graph Wegman used to illustrate his argument, your seventh link shows no source, your eighth link is to large to address in its entirely, some bits are out dated others meaningless, your ninth link is I guess some sort of popularity contest, so meaningless with respect to the science. Well what I want to know is whether I can make myself a Mann / McIntyre / McKitrick / Mouse / Iowahawk / whatever, Hockey stick from the numbers in the Mann Hattan Telephone book; mebbe that’s the Mad Hatter Telephone book; well either one. I happen to be among the cognoscenti who are very familiar with the Sally Baliunas / Willy Wei Hock Soon paper referenced above. Read it as Soon as Willy and Sally published it. What say you Iowahawk ? Your Excel spread sheet robust enough to Hockey Stickefy a Telephone directory ?? There’s nothing quite like watching someone flail about in defense of Mann’s hockey stick. This has been an otherwise humorless afternoon, so many thanks for your efforts. You presume that there is a way to extract temperature data from these proxies and then send readers on a wild goose chase. The fact is, it does not really matter for this discussion. Mann’s methodology has been shown to be flawed given it’s sensitivity to minor input data differences. It’s not incumbent on me to show a “correct” methodology, even if one exists. Mann’s is still wrong and his conclusions worthless. You can’t change this with logical fallacies. It’s all in how you SAY it…. roBUST! Emphasis on BUST! I wonder a bit why it should be a problem that the proxies are correlated. In my opinien they should be if they really are good proxies for temperature and then some sort of average would do better. It takes a little work to format dataseries so that you can copy them into the calculator, but then it works fine. I doubt the results of such treatments. If you have two series that goes more or less opposite, the first component will resemble the variation of them, the next component will be very small and only have the “noise”, but the first component only shows how they variate, not that they more or less cancel each other if averaged. The crucial point is to select the number of components and their weights, and in there is the devil in all his might. Notice I didn’t include anything Andrew W says because this whole CAGWCF* issue hasn’t been about science from the beginning–so why reference other sources that aren’t about science? Come clean, Andrew–where is YOUR SCIENCE? But to the bigger issue, the question remains: Is Mann a criminal or a totally inept scientist? My answer (and you all chime in now, you hear?) is that he’s both: he’s an inept scientist that has committed criminal behavior to cover his ineptness. And that makes him the worst type of “scientist” possible. Sorta like a lot of other “climsci” people out there slopped on the trough of taxpayer funding. *CAGWCF: Catastrophic Anthropogenic Global Warming Control Freaks, aka “watermelons”. I urge readers to read what the National Academy of Sciences said. And to read the numerous other studies in scientific journals which found the same relationship with temperature. See! It’s replicable! What’s not to like? Available where? Which of it has been jiggered in which ways? After following the web log for a while, it’s all a very confusing mess, from my POV. Perhaps if I wanted to set aside all other interests. I think Mann was playing with words. Clearly “robust” means you get a hockey stick no matter what data you put in. Multiple wrongs (regardless of how many) don’t make a single right. It is not a problem for the proxies to be correlated. Indeed, if they are all linear combinations of the inputs (to tree growth), they should be correlated. What can’t be correlated (for PCA to work properly) are the inputs, i.e., the source signals driving the proxies, e.g., ring width, that PCA is attempting to extract. The components that result from any method (principal components, eigenvectors, etc.) will be uncorrelated by definition. If the inputs are correlated, then clearly any uncorrelated components that were extracted are not representative of the inputs. I urge readers to read what the National Academy of Sciences said. Many of us have. Besides the fact that they were hardly providing a glowing endorsement, none of those that “said” the NAS position really dug into any of the details. And to read the numerous other studies in scientific journals which found the same relationship with temperature. Using the same data and same basic methods*, of course. That’s the problem. Take a subset of the data and the results vary widely. In general terms, this means either the data, the methods, or both, are ill-suited for the purpose for which they are provided. * If you do not understand what I mean by the “same basic methods,” then you are not capable of understanding any of the criticisms anyway. Thanks smokey, your first link crashed my computer, your second link sent me to a Russian bride dating site, your third link is only works with Netscape, your forth link gives no destination, your fifth link means nothing to me, your sixth link doesn’t actually show a number to call for a Russian date at all, it’s just a photo of random scribbles from a outhouse wall that Mann used to illustrate his argument, your seventh link shows no sauce only the meat, your eighth link is too large to cut-and-paste in its entirely, some bits are out for a date, your ninth link is I guess some sort of popularity contest, I have to go now Mom is calling me for bed-time. If the inputs are correlated, then clearly any uncorrelated components that were extracted are not representative of the inputs. I should have noted that they may be representative of the inputs in such a case, but there would be no way of knowing how. For example, given two inputs that are correlated, x1′ and x2 where x1′ = x1 + f(x2) and x1 and x2 are the uncorrelated pieces, PCA may find x1 and x2, but would be unable to determine x1′ without further information. Using the results of PCA to generate the function f() brings to mind the concept of a self-licking ice cream cone. Funny, I clicked on Smokey’s first four links and they all worked fine. Not sure what your problem is, Andrew30, other than perhaps you really do need to get in for bed ’cause mommy’s calling. I think Andrew30 was making fun of Andrew W’s complaints about every chart I provided. And you’re right, all the links work. Andrew W = PEBCAK. I never had the chance to have a look over these numbers and methodology. So I’ve been playing with the spreadsheet offered by iowahawk. 1. I don’t understand the advantages of doing a PC analysis and then retaining ALL the factors. This is the same as working with some kind of rescaled original data. By the way, the result of the PC analysis is VERY poor (little variance explained by the main factors). I haven’t tried it, but I’m sure that the full study can be reproduced without the PC analysis. PC analysis are used to extract the main variance source and to discard the ‘noise’ … the name PRINCIPAL refers to the fact that usually you’ll stand with the PRINCIPAL factors and you’ll throw away the rest. But if you have 15 variables and use the 15 factors … where is the advantage ? 2. What the PC analysis says is that the proxy data is very noisy, is so noisy that it can be used to extract from it whatever pattern you can imagine. It’s like a bunch of clouds, everyone can see whatever figure he wants by looking at it. What McIntyre found is obvious to people with pretty good knowledge of Multivariate Analysis. 3. What the linear regression does is to take the high variability of the proxy data to reproduce the increasing trend in the 19 and 20 century. With 15 variables you can do this using almost whatever noise source. If you only had 2 or 3 variables … it would be a very different problem. Once extracted the ‘right variability’ to reproduce the recent temperatures data … what is left for the rest of the series from 1400 is … noise, the exact same noise that the proxy data is. So … yes, the stick is constructed. The whole analysis is useless. The guys that did it have absolutely no idea about statistics. FWIW, that isn’t excel in the picture. It’s Openoffice Calc. I’ve computed correlation coefficients between temperature and the 15 factors from the PC analysis. The highest correlation is 0.45 for factor 2. This is not high enough. Temperature variation is not a significant source of variability for the proxy dataset. From the point of view of temperature variation, this proxy dataset is just noise. It should not be used in any way to try to explain the temperature variation. Don’t forget the upside-down Tiljander over and over….. Apparently you’re unaware that the methodology hasn’t been shown to make hockey sticks out of white noise (random data) but out of red noise (Drunkard’s Walk). Unless you’d like to make the case that numbers in a phone book are red noise, your proposed test is like trying to find out if squeezing tomatoes will get you orange juice. Instead of proposing someone else do such-and-such a test, though, why don’t you find some sources of red noise, and put them through this exercise, and let us know your results? That’d be a useful contribution. Gee, Andrew30’s Mom really was calling him for bed. When Andrew30’s Mom tucks him in, she’ll have to remind him again about why he shouldn’t be viewing some of those unsavory sites on the web. Smokey’s links work fine for me. I particularly like some of the pre-climategate links. Very interesting when you consider what has transpired since those astonishing days. RDCII: maybe you should investigate the terms white noise, red noise, and random data. Your assumptions regarding these concepts are clearly incorrect. Sorry, I don’t know my Andrus’s from a hole in the ground. Rich Lowry: You are now a hero of mine. If you wish to set up a fund to fight Mann just let me know through WUWT or the National Review. I am sure you will have no trouble getting a “Fight Mann Fund” togethe;, yes sir the Mann’s of this world need to taught a lesson in freedom. Well done Rich! “But it was the best butter,” the March Hare replied. They figured out space flight, launched how many satellites? Made the Space Shuttle & piloted it. Should I believe them or some guy with solar cells on his roof? hmmmmmm……..
You probably don’t know that Anthony Watts is a businessman and a peer reviewed, published author on climate studies. He does not “run a website for a living”. Now you know. NASA used to be a great organization, before it decided its top priority was ‘Muslim Outreach’, and before Hansen hijacked GISS for crazy CAGW propaganda. I think I’ll believe the guy who put solar cells on his roof, over a know-nothing. Note the climatology in your reference. Then explain what, to your mind, problem exists? Please remove your head from your arse before attempting the removal of your feet from your mouth. Lee Wells, there is an organization called NASA JPL located in Pasadena, California. NASA JPL puts humans on the moon and rovers on Mars. These are the “right stuff” people. I thought you guys said solar power was a good thing? If you want to see how “robust” the surface temperature record really is, I suggest you read, and seriously consider, Watts et al. 2012 Draft Paper. Conclusions are only as the data they are based on. AHHHH! I did it again. Even the boss of Giss thought Giss data was garbage. Clearly you missed the letter in the Wall Street Journal signed by 49 of those stellar folk telling NASA to knock it off with their climate antics. Not quite, Tim. He said that he thought the models were useless. It’s worth pointing out that Mann’s “boss” said nothing about GISS data in general, only the models. That said, I think he’s wrong about transparency, the models, and the observations. In general, the data, processes, and results have been published. While I think that there’s still room for improvement, my experience is that much of the problems with “transparency” actually lies with those who aren’t familiar with the scientific literature. For instance, Mike’s “trick” to “hide the decline” was widely held up as an example of deception or fraud by climatologists, even though there’d been several papers in big journals explaining use of the “trick”. In the end, the only legitimate complaint was that Mann et al. should have been clearer about the chart which made it into the IPCC report.. but given that this chart was well-explained in the literature, and quite well-publicized, the problem was one of communication, rather than of willful intent to deceive. Most of the hullabaloo was by people who hadn’t bothered to read the literature, and see that, yes, his “trick” was well-published. It’s dishonest to say that someone’s hiding something if they’ve put it up in plain sight. Now Mann et al have published a new paper, corrected for the legitimate math errors that McIntyre brought up, and the shape of the graph is still pretty much the same. There’s still a hockey stick. Additionally, scientists have now published a dozen or so other proxy records, from places scattered around the globe, again showing a sharp increase in temperatures in the last 100 years. Last, while the actual degree of warmth during the MWP is still somewhat up-in-the-air, evidence is pointing towards it being warmer now. Most of the proxy records that are coming out line up with this. (Of course, different records from different places will give different results. The temperature trends of Australia and Greenland are only loosely correlated). Always willing to be corrected. Are you saying that numbers in a phone book are an example of red noise? That would affect my main point. Are you saying that numbers in a phone book are not random, or are not white noise? Yes, I can see an error on my part there. Is that what you meant? I always love it when skeptics provide complex and comprehensive data and the believers come along and use rhetoric to try and quash it rather than alternative figures. The vast majority of appeals to authority and simple playground insults can only illustrate the utter emptiness of a movement who would rather see poor people freeze to death and third world farmers starve as their food crops are sequestered for biofuel than what could only be a slightly warmer planet. The incredible selective blindness to specific data presented is as telling as the half baked attempts to justify their general claim without ever managing to go into details eg “So you think polluting the planet is a good thing”, can only mean they haven’t a clue. Even the highest names of all rarely if ever reply using any more than the identical tactics followed by their vast army of lower orders, the best most can manage there are copying and pasting the same links from John Cook often written before proved thoroughly wrong by later material, while such greats as Phil Jones simply says in BBC interviews as 90% of scientists agree then it’s simply not up for discusssion. So to wind this up to an actual point and punchline. In this long list of extremely valuable comments, including a couple who challenged the piece using arguments better suited to a remedial school, lies one little link I am all too familiar with (and only referred to indirectly by Andrew) showing something which (using a statistical term in its general meaning) has more weight than the others put together. The IPCC kept the medieval warm period until someone removed it. There was never a single claim it was wrong beforehand, so clearly not challenged by them or anyone outside at the time, and quietly vanished as if cutting off a limb and expecting no one would notice it had gone. I would suggest Anthony (may I use the familiar) should devote an entire post to this alone, as (with a background myself in law but a great interest in science), it’s not always the complex and byzantine frauds which undo the criminal, but the schoolboy errors like dropping a fag end at a crime scene covered with DNA or putting stolen money in your own bank account. Once a crook does something in an unguarded moment which more or less opens the cell door for the state, the other evidence doesn’t really matter, mainly as nearly all criminals by now would have made a full confession, negating the need for a trial and raising all the other complex evidence. Now I’m not saying this shtick alone could derail AGW, if only this was true, but every single warmista I’ve flung this in the face of has skated over it and reverted to generalities ‘you want to kill my unborn grandchildren’ for instance. They can’t defend the data, why not? Because it’s indefensible. I’ve spent over 10 years investigating it and now published my findings. If the general public could see my material in large numbers they would lynch the IPCC and its lackeys around the world’s once esteemed scientific institutions. But this MWP excision is not a smoking gun, it’s a fingerprint. A whacking great one on the murder weapon. And one I’ve never seen a single excuse for despite many attempts to ask for one. Anthony, over to you, please highlight this phenomenon as it’s a biggie. David Andrew Howard, an excellent reply. So much wisdom can be encapsulated in simple aphorisms. On another forum I was challenged with the “You want to kill my unborn grandchildren?” type of specious non-sequitur argument. It would be lovely to see the hockey stick graph tested in a Court of Law. Hopefully, it might happen as a consequence of the legal action brought by Mann against Dr Tim Ball. Thanks Mike, preferring what I would call leisure areas of research by choice, I began by investigating this area out of curiosity after a few year’s worth of remarkable media reports, and simply wondered why after all that time I hadn’t noticed anything happening, and wanted to check how everything was going. What I found was like opening an old container of food and finding it full of maggots. I couldn’t believe how different the actual figures were from what the papers had said, how tiny rises in temperature and an almost negligible change in sea level could cause such a performance despite the fact nothing unusual had happened. The answer itself was in the future, all these disasters hadn’t actually happened, but would for sure. Except they weren’t sure how much, it could rise 6C and it could rise 0.5C. Now that’s not a prediction but the most extreme form of hedging you’d get from any dodgy psychic who was only in it for the money and fame. And worst of all these predictions, made around 2000 at the time, were for 2100. Science requires observation and completion of experiments. They had openly set the finish date beyond the point it could be known, thus killing the theory stone dead on day one. Then, on top of the diabolical data I discovered the Club of Rome and others, mainly led by David Rockefeller (he seems to be behind everything and proud of it), had openly stated back in 1991 that the threat of global warming would be the key that would unlock the new world order. Oh really, so what does that mean? Inventing a problem which most people wouldn’t be able to tell was happening and then offering a world government and massive taxes to solve, and then when it didn’t happen as expected say the medicine worked and laugh all the way to the bank. I then went about gathering the data, and now have it all collected and am looking for a company to publish it. Once the public catch this scandal it would die overnight. (i.e., we did not know enough to forecast climate change or mankind’s effect on it). He thus embarrassed NASA by coming out with his claims of global warming in 1988 in his testimony before Congress. My own belief concerning anthropogenic climate change is that the models do not realistically simulate the climate system because there are many very important sub-grid scale processes that the models either replicate poorly or completely omit. I just thought of something, being a web analyst. Has anyone considered what influence the lowering of the amount of temperature stations in the statistical material for global average temperature does for random fluctuations in data and their significance for average calculations, especially when adjusting data upwards in a artificial fashion. Wouldn’t that create a higher amount of temperature extreme highs, just like we always see smaller communities have higher cancer rates, better education scores, etc. I see this constantly, when working with web analytics tool that samples data above 250k visits (Google Analytics) and I just Read Daniel Kahnenmans book “Thinking fast and thinking slow” which demonstrates human intuition to accept data, even though it has been influenced by lower sample rates? Yes, John Daly noted the same thing as per Smokey’s link above, and there are many other “fingerprints”. Anecdotally, the mere fact that the ipcc released its scientific conclusions from the TAR months before its supporting science touched me off the first little bit back in 2001. I’d never heard of that in the publication of “peer reviewed” science! I stuck with their “science” in the spirit of not expecting a group of scientists to not be practicing real science and given my own ignorance about the usual or acceptable practices of Climate Science, but the maggots just kept on multiplying. The problem is that for whatever reason a great many people who should know better just won’t make the call as to the fact that “mainstream” Climate Science is simply not real science, but instead only a massive Propaganda Operation – a fact which explains nearly everything we see from its players. That’s what we’re up against in getting these “fingerprints” before the “court”. The basic problem is that the models use proxy data for paleo-temperature data (since, of course, no thermometers were there at the time) but proxies are sensitive to other phenomena than simply temperature. The Mann et al didn’t properly account for other factors in creating their curve. The major problem in getting these items of forensic evidence to court is no such process exists. The climate machine was created pretty much outside the law. In fact one organisation (someone will remember which branch or twig of the UN) is currently applying for full legal immunity for their actions as I write. There was never any mechanism set up in order to question in any way the findings of such organisations. The best they’ve managed are pretty much internal enquiries over Climategate headed by such as Lord Oxburgh whose main personal wealth comes from green industry. But technically unless they have clearly appeared to break the law in known areas there is no wrongdoing they can be accused of which can be tried in a court, and furthermore no authority to either report them to or send them to trial, as ‘they’ as such are the judges already, being the governments of the world who sponsor and produce these wrongdoings. In fact it seems the sole way of catching them out officially is backwards, using the old route of lateral thinking’s brother, lateral acting. This means not trying to take them to trial as currently there is no known way, but get them to take someone else to trial, and thus having to reveal their own data in a court of law, much like the only case I know as yet of Al Gore being found to have made a list of errors so long the judge drew a line and said he’d counted enough to make his decision already. As this was a film and not a scientific paper Gore was excused as only a PR man, but now Michael Mann is taking his detractors to court one by one, he may well go the way of the Scientologists who ended up having all their secrets published as evidence. The rule here is all that needs doing is to get them in court, not how it is done, and Mann seems to be the only one stupid or crazy enough to do it. Of course the second way to catch them is simply by getting the dirt on TV, it’s happened here once in The Great Global Warming Swindle, which must have won a few over, but since then the new data and outright confessions I’ve collected alone would sink the movement dead in an hour if presented to the viewing public. No one likes to know they’ve been taken for a mug and would be the equivalent of the French Revolution. If anyone here is in the media please let me know as I have completed the full package and is now ready for release. I studied law so did not reveal my material until it was completed, unlike the joke story about the Arctic melt which is doing as much to dismantle their case (if not more) than support it (as it’s weather!). You can contact me by clicking my name here.